The earliest evidence of human presence in the Western Hemisphere has been found in Oregon. Thanks to the latest research by University of Oregon archaeologist Dennis Jenkins, PhD '91, and his colleagues at the UO Museum of Natural and Cultural History, we now know that people have been here for more than 14,000 years. And unlike past discoveries that were plagued with controversy, these new findings appear to be rock solid. As reported this summer in the journal Science, Jenkins and crew found ancient human DNA from fossilized feces (coprolites) radiocarbon dated to about 14,500 years ago, and Western Stemmed projectile points—stone spearheads or darts—dated to about 13,200 years ago. These are as old or older than stone tools found near Clovis, New Mexico, previously thought to be the oldest human technology in the Americas. To confirm the accuracy of their findings, an independent laboratory conducted blind analyses of 65 coprolites and obtained more than 100 high-precision radiocarbon dates from materials in the caves. "In the past, radiocarbon dates of this age, basically 13,000 calendar years ago, have been obtained near Western Stemmed projectile points, but never could people demonstrate beyond a shadow of a doubt that the two were associated," Jenkins says. "If our data continues to hold, which I believe it will, then now there are at least two technologies on the landscape and that means there could be others." These new revelations and the report in Science have catapulted the UO archaeology program and its field school into the international spotlight with media attention from the New York Times, NPR, the BBC, the CBC, and France24. "So many people in Europe know about the archaeology we have done here," Jenkins says. "It's going to raise the prominence of Oregon as an archaeological research unit in the international market for students." But these latest developments didn't happen overnight. "We've been working on the Science article that just came out for a couple of years," he says. "They don't publish just any archaeological work. You really have to have something that changes the way people think to get into Science." He imagines that the first settlers traveled from Siberia to Alaska over a land bridge, establishing a human presence in the New World in at least two separate movements. The Clovis people probably came through the interior of the United States, while people making Western Stemmed tools traveled along the coast. They were hunter-gatherers and would have encountered fertile land—cooler and wetter than now—with edible plants, and big game to hunt. And although the Paisley Caves, now dry and desolate, would have offered a lakeside view back then, "this was not a destination location," according to Jenkins. The evidence indicates that the first Americans probably stopped here to find shelter for only a short time and then moved on. Jenkins's evidence has been building since 2002, when he first took the UO's Northern Great Basin archaeological field school to south central Oregon's Summer Lake basin, about 130 miles southeast of Bend, to excavate the Paisley Caves. Their mission was to continue the research that Luther Cressman, a UO anthropologist known as the "father of Oregon archaeology," started in the late 1930s. Cressman reported finding Pleistocene animal bones associated with stone tools, but his artifacts were not well documented and other archaeologists questioned his interpretation of the evidence. "In 2008, we published in Science and there was a huge hoopla about that," Jenkins says. "Paisley was projected into the international spotlight at that point." In that article, Jenkins and colleagues reported finding 14,300-year-old coprolites that contained human DNA, but some archaeologists suspected that the samples were contaminated by more recent DNA from humans and rodents through water and urine that could have seeped down through the caves' sediment. That sent Jenkins and his field crew back to work. For the next three summers, they returned to Paisley and meticulously excavated the caves. "If you're not careful about how you collect your samples," warns Melvin Aikens, UO professor emeritus of anthropology and former director of the field school, "you might just be sampling the DNA of your field crew because they're all raining DNA every day." Jenkins learned that the hard way. When he received the initial results that human DNA had been found at Paisley, he had to contact all of his students and get samples of their hair to verify that what he had was actual ancient DNA and not modern contamination. "We tracked down 60 people and eventually demonstrated that none of them matched the DNA that we had," he says. "I had students sending me hair from all over the world." So when they're collecting samples these days at the Paisley Caves, they take extra precautions. As Aikens describes it, "They're wearing moon suits." In July, Jenkins, with the help of 19 other researchers, including Tom Connolly, MS '80, PhD '86, director of research at the UO Museum of Natural and Cultural History, published the report in Science that finally validates what Cressman believed to be true decades earlier. "What's really significant about this," Jenkins explains, "is that we have meticulously dated these Western Stemmed projectile points to the same time as Clovis. And while that had been suggested in the past," he adds, "nobody had been capable of generating the evidence that we have so strongly put together here." But he also knows this is not the end of the debate. "I expect that some controversy will continue," he concedes. "However, the responses that I'm hearing from other archaeologists right now are that they think this is an incredible piece of research—they've never seen anything like it." The UO's archaeological field school, founded in 1937 by Cressman and revitalized by Jenkins and Aikens in 1989, has been instrumental in these discoveries. "Our field school is designed to do real research," he says, "and I've always tried to incorporate the students, as fully as possible and as much as they're capable of doing, as colleagues." Since 1989, Jenkins estimates that the field school has trained more than 600 students. Each summer, a three- to six-week session is offered and about 25 students participate. Students are up at 6:00 a.m. and work a full day in the field. "It's eight hours of intensive labor," he says, "some of it physical and certainly some of it mental, just trying to do the best you can every second, because the one second you're not paying attention could be the one when you make that incredible find of your lifetime." 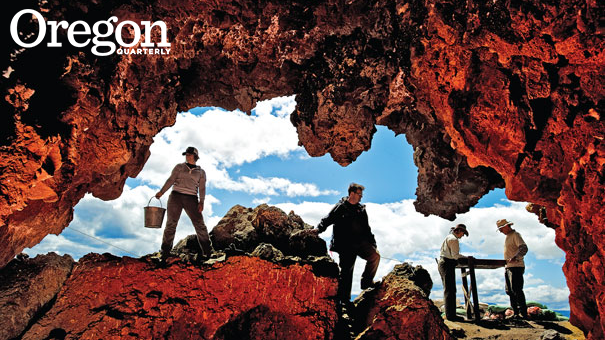 In 2011, UO Museum of Natural and Cultural History archaeologists Dennis Jenkins, Melvin Aikens (professor emeritus of anthropology), and Tom Connolly coauthored Oregon Archaeology (OSU Press), a comprehensive historical account that documents Oregon’s cultural history—from Paisley Caves to trends in the development of modern Oregon. Filled with detailed maps and photographs, the book is an important resource for anyone interested in the fascinating story of Oregon's past.